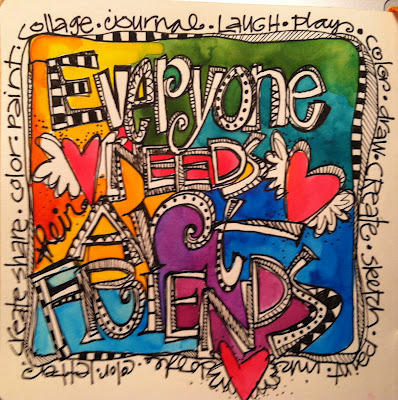 “Whimsical art maker” Joanne Sharpe is a colorful mixed media artist and enthusiastic teacher with a passion for art journaling, lettering, doodling and illustration. Joanne’s playful art has been featured in the popular publications Cloth Paper Scissors, Studios, Somerset Studio, Somerset Art Journaling and Somerset Apprentice magazines. I love her bright colours, lettering and inspiring doodles.